Avaaz - Glyphosate -- Crushed it!! Europe just took an extraordinary vote, refusing to grant Monsanto a license for its main product and cornerstone of its empire - the cancer-linked weed killer glyphosate. Monsanto thought renewal of glyphosate was a done deal. But now, after over 2 million of us joined the biggest global petition against glyphosate ever and massive targeted public pressure, the future of the Monsanto model is more in question than ever before. Together we forced this from a formality for a new 15-year license into a heated political debate that ended up as a vote on an 18-month emergency extension. This week, European nations rejected even that. 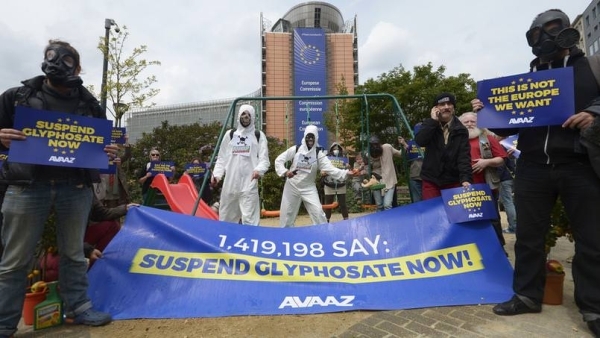 Avaaz staff met with the office of the Commissioner for Health and Food Safety last year and secured a crucial promise that the UN study, that found glyphosate probably causes cancer, would be included in Europe’s decision-making. Last week the Commissioner's top advisor said our push had played an important part in the debate. Over a hundred thousand European Avaazers sent messages or made calls to their governments. We showed up every time it’s been debated in Brussels, ensuring that support collapsed, and the vote was suspended twice! Throughout the last year we’ve been all over European media showing massive public rejection of glyphosate. Check out the media hits in The Guardian and Reuters! Avaazers bolstered the champion, France, with massive public support. Avaaz staff delivered our petition and positive voices to the Environment Minister's staff and restored their hope that a different future is possible. Avaazers flooded German Ministries with calls and messages for months. Staff in the German Chancellery said that there were so many that Chancellor Merkel was being kept in the loop. After a huge push by Avaazers and 44 other major Italian NGOs, Italy flipped from supporting the plan to voting for precaution. The Agriculture Minister’s Head of Cabinet even called Avaaz staff at night to say they’ve never been under this kind of pressure before, and were hearing our calls. Avaazers from Austria, Greece, Portugal, and Sweden rallied in massive numbers to influence decision-makers, forcing them to stand strong. And in the last week messages from across the planet have shown them this is of global concern. 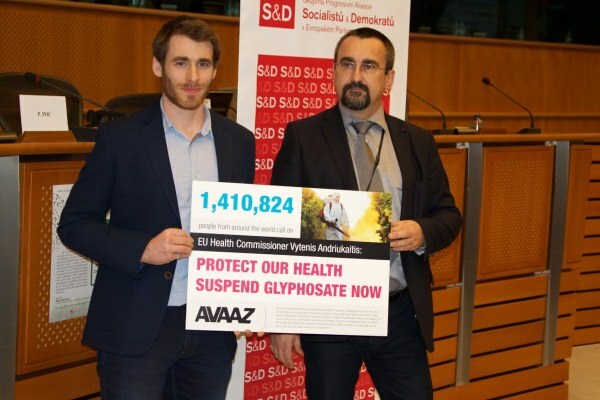 Avaaz staff addressed members of the European Parliament delivering our voices before they voted to end non-professional glyphosate use and to cut the licensing period from 15 to 7 years. Then Avaazers came together for a public action before the May vote in Brussels and our action was covered in key media. Afterwards, the proposal was reduced to 18 months. Avaaz staff spoke with government ministers and top advisors to deliver all of our messages to key European countries. Six of the seven key countries we lobbied abstained in the final vote! Avaaz action in Brussels on the day of the Standing Committee meeting. When it came down to the final vote, all our work paid off - leaders representing half the EU population refused to authorise glyphosate, even for the trimmed down 18-month proposal we had helped reduce the license to! All of this effort was funded by over 86,000 Avaazers worldwide who donated generously to make this campaign mega. The Socialists and Democrats, and Green parties in the EU Parliament were crucial in this fight. Particularly Bart Staes and Pavel Poc who were instrumental. French Environment Minister Ségolène Royal, who was a central leader in this fight. Pesticide Action Network, a great coalition of national action networks that has long campaigned on glyphosate and provided great advice and insight to Avaaz. Greenpeace, always a wonderful force on these issues, which did a lot of lobbying and media work on glyphosate. Campact ran a brilliant campaign in Germany, and matched massive open letters, polling and bird-dogging to play a key role in flipping the German government on glyphosate. And many others! Like HEAL, WeMove.eu, Global 2000, and a great coalition of Italian NGOs on this. When we launched this campaign a year ago we were told there was no way we could win. This week’s vote is a key victory for our community’s tenacity, for the people of Europe, for independent science, and it is a crucial step towards our whole world's food future! Without the support of EU governments, the Commission should act with precaution. Even if it renews glyphosate's license for 18 months pending further science, we will keep fighting to ensure the review is independent.